unfortunately turned out to be an endlessly wet day. 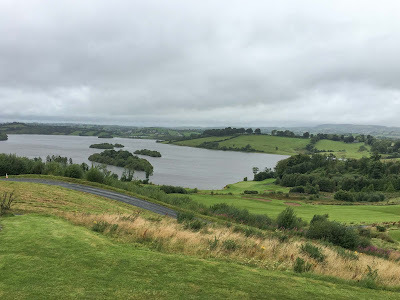 It mattered little – the only disappointment was not being able to absorb the views over the drumlins of Co. Monaghan and Lake Muckno – for which the course is famous – and take a few good photographs. Concra Wood opened in 2008, following the design work of the Christy O’Connors – Junior and Senior. It starts up high, where the clubhouse boasts all the views you could ask for, but the 1st and 3rd drop sharply downhill, with the par four 3rd looking glorious from the tee, the green on the lake’s edge far below. From then on it’s a rollercoaster with several holes clinging to the water’s edge, the par five 4th most notably and much of the back nine… here’s dad driving over the water on the par five 15th. It is 180 yards plus of carry to the shortest point… but dad’s only 85 so he went for a slightly longer carry. And made it. He also chipped in from 20 yards to make it his ‘hole of the day’. My hole of the day was the signature 10th – a duffed 5 iron followed by four 9 iron shots as I descended to the green. Let’s just say it was one of my more creative bogeys. It takes less than 90 minutes to reach Concra Wood from the Sandyford Industrial Estate, which makes it very accessible to Dublin golfers. Get on the M1, drive north, turn left at Dundalk. How hard can it be! 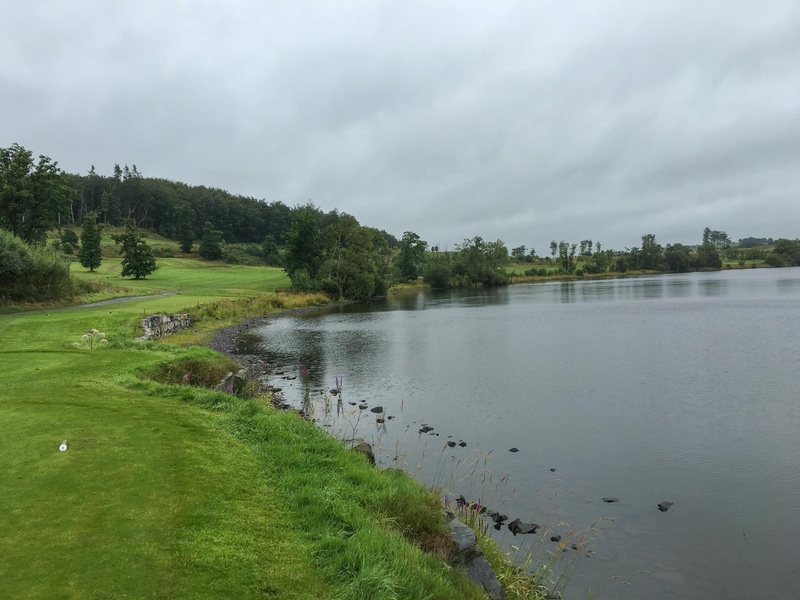 Most of the club's business comes from the North, but 90 minutes isn't exactly a long time when you're going to play one of Ireland's top parkland. This is a course where you’ll have lots of fun and from the bar and restaurant (completely packed when we were there – and given the quality of the food it’s not hard to see why) you get some great views over a number of greens far below. Concra Wood ball marker and course measurements. I rather liked this little item in the Pro shop - a ball marker set into a disk with the measurements of all of the course's 18 holes. True, the measurements are from the Black back tees, but it's a quality piece. 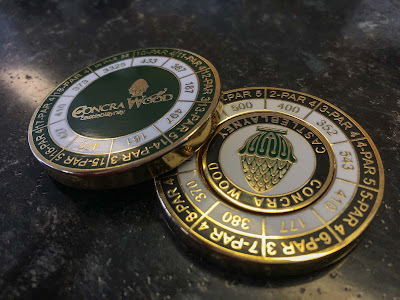 Conor, the Head Pro, kindly donated one to my blog so if you'd like to win it, simply leave a Comment below and tell me which county Concra Wood is in. I'll pick a winner on Sunday. Concra Wood is one of the highest scoring courses in Hooked – I suggest you pay it a visit and find out why. Concra Wood is in Co. Monaghan. 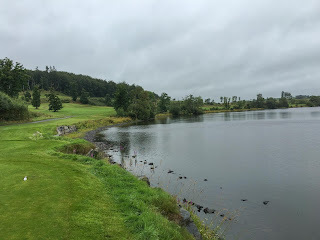 Co. Monaghan, didn't realise it was that close, it's high on my golf course bucket list. Enjoyed your post. Monaghan. On the bucket list for sure. 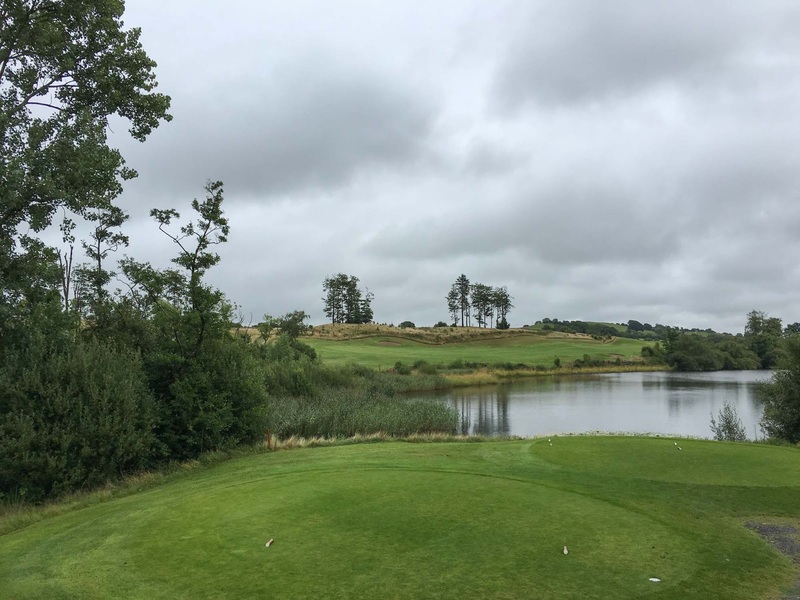 The layout, the greens, the views, and the people make Concrawood the stunning gem that it is. What's surprising is how many golfers have yet to discoverit. Smashing course in Co. Monaghan. Fair play to Mr. Markham Snr. played it last last year, very enjoyable round of golf and a nice meal afterwards!